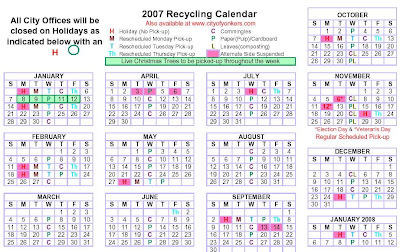 Hi everybody-- Just to let you know that the Yonkers Recycling schedule for 2007 is now available, so if you happened to be relying on this image (versus the cityofyonkers.com pdf, then this is the one you should be looking at. Comments on "Yonkers Recycling Schedule"
I am looking for a current Yonkers recycling calendar. The City of Yonkers has the same 2007 calendar that you have. Has Yonkers stopped producing these calendars? Maybe they just stopped putting the info on the internet. All I want to know is: Is today paper of C? But it's not very clear-- I've created a Google Calendar that you can stick in your calendaring program, or just visit from time to time. And today (September 30, 2009) is paper! Thanks for the link. I could not find it this morning, though I did find a link to their 2006 listings. Also, thanks for the link to your public calendar. In frustration this morning, I just put out both P and C!